Weapons: HellRazor is equipped with a number of blades across his arm that when combined with his strength, are capable of piercing even the Dragon’s thick hide with relative ease. HellRazor was one of the earliest foes that the Dragon faced after his induction on the police force. He had been one of three Vicious Circle members that had become too ambitious for the likes of OverLord. They were dispatched to kill Dragon but all four men had actually been targeted for execution by SuperPatriot, a pawn for Cyberdata. This plan did not go to plan and although Basher was killed, HellRazor and Mako survived, albeit with serious injuries. They were incarcerated at Stronghold Penitentiary where a mass breakout was later organized. HellRazor was one of those that escaped, later joining Cutthroat in hunting down Dragon, injured after his initial encounter with OverLord. Despite his serious injuries, the hero still claimed victory and HellRazor was apprehended once more. 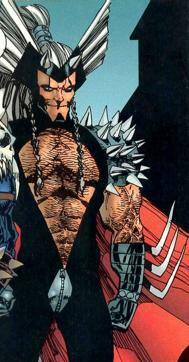 HellRazor later regained his freedom when CyberFace broke numerous Vicious Circle members out of prison. He was one of the forty or so villains later dispatched by Horde to kill Dragon, only to get shrunk down in size by a Martian weapon. HellRazor remained in this miniaturized state for a couple of years before ultimately getting restored to full size. When CyberFace lay claim to the entire world, a small faction of the Vicious Circle were abandoned in Chicago. HellRazor led this group in the devastated city and when Dragon approached them for help in overthrowing CyberFace, the villains agree. They took part in a raid upon the White House where the power-hungry SkullFace made his move, stabbing HellRazor through the heart.